Maple leaves atop these andirons are reminder of cool fall evenings. Andirons are important hearth accessories that provide a platform on which to stack your logs. Kindling can be lit in the space underneath which also creates an updraft to keep your flames alive. Our wrought-iron andirons feature an additional center leg to prevent sagging due to heat or weight. 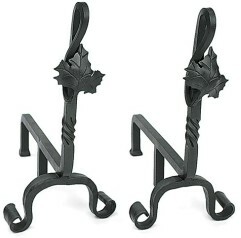 They are available in a variety of heights and designs to suit any decor. Suitable for both indoor and outdoor use. Maple leaves atop these andirons are reminder of cool fall evenings.